Feel the Green Sting of Heavy Nettles! Spring is the best season to start anything. The energy of the Earth is supporting new beginnings of all kinds. We can use all that winter compost and the breakdown /breakthroughs of 2018 to now fertilize the next steps for abundant health at all levels. Even if you don't believe you can change- you can't help but be amazed at all the changes nature shows us in the spring! If a bare tree can suddenly be full of beautiful blossoming energy- so can we! I want to share with you my favorite spring plant ally in sourcing the energy that so many of us feel is lacking to break the cycles of self judgement and fear. I will be using plants as guides to self care medicine this year. As a farmer I work with lots of plants- I mostly have spent time pampering the domesticated veggies but some of the most powerful healing energies in my field are actually the weeds! The war on weeds in farmer's fields reminds me of the war we wage on our bodies. Weeds are really nothing more than the Earth trying to protect and care for her own skin. She covers bare ground with the weeds that spread out like band aids and keep soil from eroding. She replenishes her mineral content with weeds that tap into root energy and bring those nutrients up to the surface. She nourishes her bees with lovely flowering weeds that burst into pollen early in the season. Because we are a part of the Earth our own body's self care is intertwined with the seasonal medicine of the Earth as well. In spring we find the Earth offering us the most potent spring tonics for deep cleansing and strength. I wanted to focus on a plant that is a remedy for some of our shared struggles that were expressed after the last post's shout out. Feeling tired, low self worth, fear of failure, lack of abundance and general stress and anxiety. 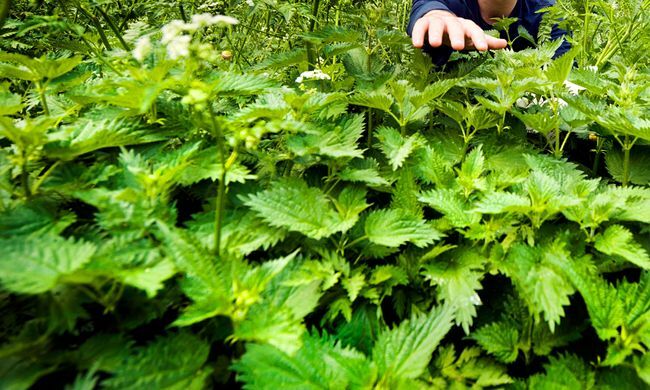 Stinging Nettle is a powerful spring medicine. Many people consider it a noxious weed but I am joyous whenever I find some growing wild by a river bank. It's like finding a free source of energy. I am slightly anemic so I begin to crave the high iron content of spring nettles after a long winter of eating storage squash and potatoes. The deep green plants are the one of the best sources of calcium and iron for our bodies. You can find nettle patches growing all over Oregon in the spring. If you are in doubt just touch the stem and the "sting" you will feel will instantly verify their name. They are also easy to grow in your garden and I have my own patch that I harvest from as well as going on nettle finding missions in wet spots near running water (under Alder trees and near old homesteads are great bets!) If you can't find fresh nettles use dried ones or a nettle tincture from the natural foods store! Stinging nettle (Urtica dioica) packs more stimulating energy than sugar or even coffee, and without the downside of feeling jittery! According to herbalist Susan Weed; "Nettles are rich in protein, vitamins, and minerals, especially the critical trace minerals: anti-cancer selenium, immune-enhancing sulphur, memory-enhancing zinc, diabetes-chasing chromium, and bone-building boron. A quart of nettle infusion contains more than 1000 milligrams of calcium, 15000 IU of vitamin A, 760 milligrams of vitamin K, 10% protein, and lavish amounts of most B vitamins.... Nettle builds energy by nourishing the adrenals and detoxifying the kidneys ... Minerals in a nettle tea are actually magnetized into the blood stream without needing to be digested so the effects can be felt quickly"
Nettles are obviously good for you. Your lungs, skin, urinary tract, bones, hair, blood and nervous system will thank you for drinking nettle tea or even steaming them (cooking removes the sting of the plant) and eating them like a spinach substitute! (see recipes below!) Nettles is a particular nourisher of women's bodies and helps fertility, breast feeding, healthy pregnancies and menstruation. Nettles are also energetically powerful. They are known as being a plant for protection from negative energy and cleansing any bad mojo in your body and your home. Burning nettles is an ancient way to purify a space. The entire plant is here to help us break our bad old habits, cleanse our bodies and give us the deep nourishment and energy to revitalize our lives! Meditation is key to observing our mental patterns that keep us repeating the same old shame based loops. When we become still and watch our thoughts we lessen the power they hold over us and we become aware that they are not "us"- they are just thoughts we have. Thoughts can be changed- but not unless we can see them for what they are. I like meditating with plant medicine. Drink your nettle infusion, take a nettle tincture, eat your nettle pesto, maybe even give your skin a little nettle acupuncture (careful! they hurt!) and then set your phone for a 15 minute alarm and relax in a comfortable position. Listen to the plant's message as it works with your body. Offer up some self tenderness to any part of your body that you normally think ill of. Offer your gratitude to nettles for protecting you from harm, for cleaning your blood of toxins, for nourishing your energy at all levels. Do this for 3 days and take some notes on how your body or energy is feeling before and after! (From herbalist Susan Weed): Measure one ounce of the dried or fresh herb. Boil a quart of water. Put the herb into a quart jar and fill to the top with the boiling water. Stir with a wooden spoon and add water until the jar is full to the top. Lid tightly and set aside to brew for at least four hours, or overnight, whichever is easier for you. You can drink up to 2-3 quarts of nettle infusion a week to feel the full invigorating effect! To use: Strain and squeeze the liquid out of the herb. Be sure to refrigerate your infusion, as it will go bad at room temperature once it is done brewing. Nettle infusion is delicious over ice. Its rich green taste is not at its best when served hot. Adding honey can make it taste quite strange. Some folks like to add a little apple juice to sweeten it. Or stir in some miso, for a salty drink. However you consume it, do drink it up within a few days, as nettle infusion doesn't last. Nettles leaves are serrated like teeth and they’re covered with spiky hairs that sting on contact. But the sting is fleeting, and the antidote is the juice of the nettles’ own leaves. Boiled briefly, nettles turn into a rich green vegetable much like spinach. You can drink the nutrient-rich cooking water like tea, just leave out the salt. Toss pesto with pasta, spread on seared fish or chicken, or use as a dip for raw vegetables. Fill a large pot halfway full with water. Add 1/4 cup salt and bring to a boil. Fill the sink or a large bowl with cold water. Using gloves or tongs, submerge the nettles in the water and let them sit for 5 minutes. Remove the nettles and discard the water. Wearing rubber gloves, pull the leaves from the stems and discard the stems. Put the nettles in the boiling water and boil for 1 minute. Drain and spread the nettles on a baking sheet. Let cool completely. Squeeze out as much of the water as possible and coarsely chop. Place the nettles in the bowl of a food processor with the mint, garlic, pine nuts, and 2 tablespoons of the lemon juice. Process until the mixture has formed a paste. With the machine running, pour in the olive oil. Transfer to a bowl and fold in the cheese. Taste and adjust the seasoning with salt and pepper. Butter the bottom and edges of a 9x13 pan. Start laying sheets of phyllo dough into the pan on sheet at a time. Keep the sheets you are not using under a damp towel to keep them from drying out. Apparently phyllo dries out quickly and becomes brittle. Lightly brush each sheet with butter before laying the next sheet on top. I did about a 3rd of the package and then put half of the green mixture down in an even layer. Then I repeated this process one time. Finally I took the remaining phyllo dough and created a top layer. I think next time I will just do a bottom and a top layer of phyllo with no middle layer because the middle layer seemed to get lost in the midst of the green veggies. Before putting the spanakopita in the oven I lightly scored the top into serving sizes and I was glad I did too because if you try to cut the top once it is baked the flaky sheets on top get messed up. Bake at 350 degrees for about 45 minutes until golden brown on the top. Three easy but powerful ways to spring clean your brain.